Zappos began by selling shoes, but much like Amazon, has expanded their business model to all sorts of consumer goods. They pride themselves on their stellar customer service, offering free shipping for both purchase and return, and an extremely liberal 365-day return policy. Zappos.com has gained a massive, loyal following since they were founded in 1999, in large part because of their use of the review model to virtually allow users to decide if a shoe will fit properly. This design is young and fresh, but still easy to navigate and read. Basic blue is livened up with bits of bright orange and acid green. Lots of navigational tools are on the primary page for searching or browsing by type of product, style, color, or size. The audience appears to be younger people, primarily women, who would value ‘risk-free’ online shopping. 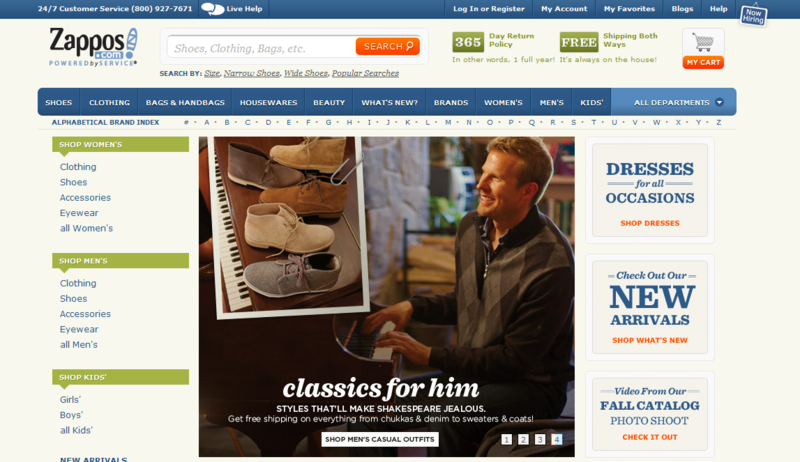 Social media integration: Surprisingly, there is no obvious social media linkages on the Zappos.com page.